Aussies tend to be nippers, which comes out of their herding instinct. Naturally, there have been a lot of questions about how to deal with this when it is unwanted and directed at other pets or people. This can be a particularly disconcerting problem when it involves children. It is best to deal with this behavior problem sooner than later and is the topic of our latest article What To Do About Dog Biting And Nipping. Another issue that should be dealt with sooner than later is the decision to get appropriate pet insurance. That's why PetPlan Pet Insurance is the Featured Product this month. You can use our affiliate link to get a quote here. Armed with that information you can decide if getting insurance or having an emergency fund that you manage yourself is the best way to go for you. Don't do it the way I did—having neither and scrambling around for money after a big vet bill hits. A vet once held my dog hostage until I could borrow the money I needed from a family member! Want to write an article for the website? We are always looking for contributors who would like to share their experience with other Aussie Lovers. Do you know about training, herding, dog sports or anything else of interest to our readers? Don't see information on the site about it or think you could add your enthusiastic voice about a particular topic? Contact me and let me know what you have in mind! 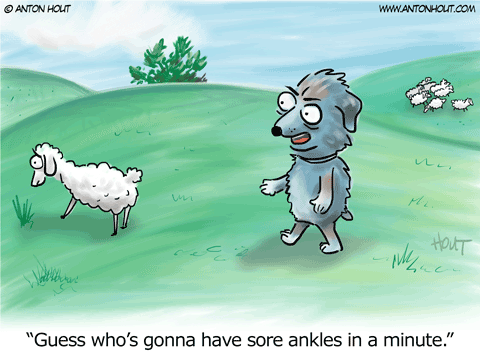 Is your dog biting and nipping due to herding instinct? How to successfully stop this unwanted behavior in your dog. 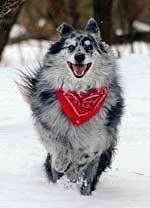 This photo of Merlin enjoying the snow is from Jackie Hamilton of Sugarbush, NY, USA. For those of you who are not familiar with our ebook "Guide To Australian Shepherd Training & Care," it is a guide that has proven popular with our readers and even includes hundreds of photos submitted by fellow Aussie Lovers like you. Thanks again for being part of our Aussie Community and supporting our efforts! Have You Been Putting Off Getting Pet Insurance? Why not take a minute and get a free quote? Customize a pet insurance policy to fit your budget and get an automatic 5% discount on your dog's health insurance just for enrolling online.